Located on a lake near West Bend, this turn of the century lake home once served as a resort for travelers seeking relaxation. Great focus was spent on updating all the amazing woodwork, and trying to incorporate modern amenities and design while maintaining the charm and essence of an older lake home. When you walk through the finished project, you feel like you're a guest at the old resort, yet everything is new and modern with clean lines and a current design. Hard to imagine not being relaxed while inside. This client enjoyed their existing kitchen space in their Menomonee Falls home, but were looking to give it a fresh look and make it more accommodating for entertaining. Adjusting the location of the refrigerator and stove, opening up a wall and adding a peninsula counter top, creating a serving area in the adjoining dining area, along with fresh new counter-tops, cabinetry, hardware, and flooring give the space a whole new look and improved functionality. We are often approached by owners of older homes in established neighborhoods looking to add modern amenities to a space which was designed years earlier. 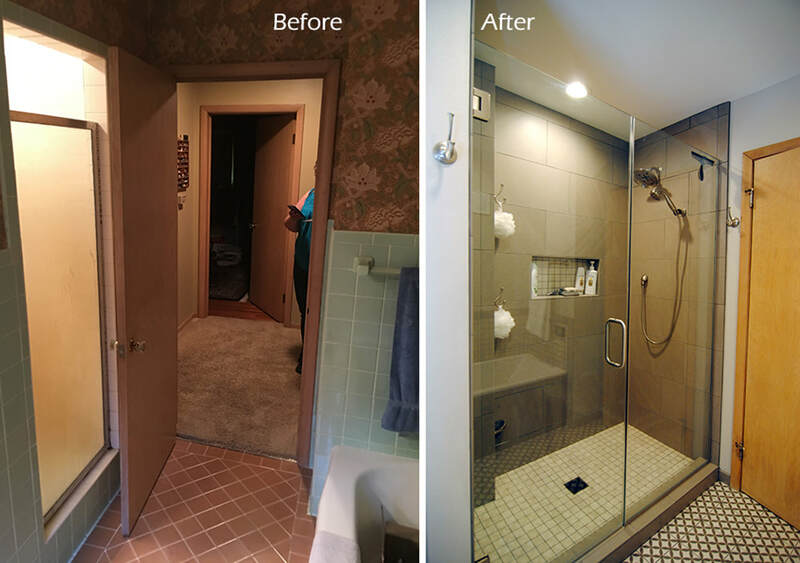 This bathroom in an older Shorewood home is another successful outcome of one of those projects. Clean lines, a monotone color palette, minimal but impactful accessories and fantastic tile work make this second floor bathroom an elegant and functional space. Sure, this Glendale kitchen looks amazing, but it's what you might not immediately notice which takes it to another level. Look closely... Do you see the wine & beverage center? Or the coffee bar area? Dual seating & dining areas? Notice the added space from a small addition? With it's timeless styling, this kitchen can serve as the center for home activity, whether that's day-to-day living or entertaining friends and family. When these Germantown residents approached us to remodel their lower level, they had a vision of creating a space the entire family could enjoy for years to come, from the adults to the multiple children under the age of 10. The outcome certainly meets those requirements. The new space includes a kitchenette, a media area, a full bathroom, a play room, and if you look closely in one picture, a home gym with sauna. We even modified the staircase to better flow into the space. We suspect many a teenage parties to come! At first glance, the Before & After pictures below might seem like different rooms, or the angle of the shot is different. Amazingly, it's the same kitchen, all shot from the same angle. Not only did we update nearly everything, including cabinets, flooring, & countertops, we also enlarged an opening into the kitchen and redesigned the layout, making the space feel larger and improving the functionality. This client was looking to add an open and fresh design to their Whitefish Bay home, but wanted to keep the charm and warmth of their 30 year old home. We removed walls and built-ins, created new custom built-ins, then updated the look and feel to accomplish their goal. The result – A beautiful media area with great bird watching views and a warm and inviting open concept connecting the living room, dining room and media area. Even when you love what you have, there comes a time when you could use a fresh look. This Shorewood kitchen is a perfect example of that. A change to the main elements - Cabinetry, countertops and flooring - along with some new design and fresh paint, and their beloved space goes from dated and tired to fresh and vibrant. For this project in Mequon, we were asked to take their dark, outdated master bathroom and create a modernized but functional space that was sleek and bright with clean lines and unique features. Mission accomplished with this amazing personal oasis, featuring an amazing soaking tub, a nearly flush walk-in shower, private toilet area, and split "His & Hers" vanities with ample storage. This Eastside Milwaukee couple loved the home and the neighborhood, but needed the house to better fit their family. For this project, we adjusted walls, removed staircases, tore down and rebuilt a prior addition to the home, and ensured all the new woodwork matched the original style and craftsmanship. Highlights include an amazing kitchen with improved functionality and updated design, a refreshed breakfast nook and sitting area, an open concept living room and foyer, and an incredible second floor bathroom update. ​Aside from the obvious upgrades to the flooring, counter-tops and cabinetry, the removal of a wall took this New Berlin kitchen remodel to the next level. The new open concept creates an amazing space for entertaining and makes the space feel and look bigger. Wow!! ​Don't worry if you think your space is too small or oddly shaped. Gabor can help you turn any space into something glamorous & efficient, and which you'll love to use and show off to others. Look what we did for this Sussex residence and their bathroom remodel. A tight, smaller bathroom has become a bright, inviting and modern looking bathroom, while maintaining their personal design style. Gabor was tasked with reinventing a smaller, outdated and inefficient West Allis kitchen space into an inviting, family-friendly, organized and effective use of space. It truly is hard to believe this is the same space. We'd be happy to help you with a similar transformation! This Thiensville bathroom update is a classic example of modernizing an outdated space. Fresh tile & flooring, a new vanity, updated hardware and some fresh paint make a dramatic impact. While the layout stayed the same, the walk-in shower looks bigger, and the entire space is brighter, feels roomier and looks like a modern day bathroom. Another example of small changes making a big difference. Updates to the cabinetry and countertops, along with adding a backsplash, gives this Germantown kitchen an entire new look and feel. This fun project had us updating multiple bathrooms in a single Milwaukee home. From the main floor powder room to the upstairs full bathroom and master bath, we were able to give three new looks which matched their design and met their budget. There is A LOT going on with this Whitefish Bay kitchen project. A complete layout adjustment made the space easier to move around in and more efficient, but also provided increased countertop space. 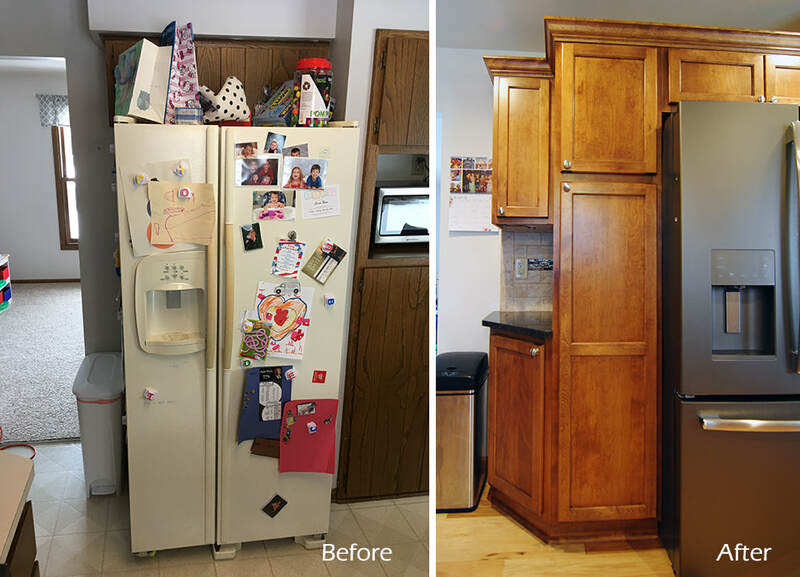 Updated and additional cabinetry provided more storage, which meant the removal of a stand-alone storage piece, opening up even more valuable space. The end result is a beautiful and functional kitchen which looks and acts larger than it's true physical size. This master bathroom remodel in Hartland showcases some unique design elements. The existing tub and shower stall were converted into one large walk-in shower with no lip, doors or privacy glass, while the large single vanity became a double-sink vanity with storage cabinetry placed between the two sinks. Sometimes a great space just needs a little "TLC," which is what happened with this kitchen in Lake Country. New cabinets and countertops, along with covering the refrigerator with applied panels, gives a fresh, more modern look to an already great space. A relatively easy and affordable project which offers great results. A young, growing family in need of some extra living space with no where else to turn but the basement. Great care was taken to provide as much as we could from their existing space. A closet was turned into a "cut-out" bar area, a "secret door" was placed in the wall so access to the furnace filter did not become an issue, a clean, functional laundry area was added, and walls were removed to provide more room and open the space up. Updates to the cabinets, flooring and countertops, plus converting a desk area into a serving counter, provides the visual impact for this Germantown kitchen, but other subtle tweaks take it further. We extended the countertop into the dining area and added stools, providing more countertop space and seating. It also makes the kitchen look and feel bigger. Then, we moved the refrigerator over by about 3 feet, which increased the walk-through space from the kitchen to a hallway and adjacent room, and allowed us to add a small "bonus" counter space area. We were approached by this Franklin homeowner to update their two existing baths and add a new bath in the basement. In the master bath, we enlarged the walk-in shower and added a bench, reduced the size of the tub, and updated the vanity and flooring. For the guest bath, we converted the tub to a walk-in shower with bench seating and updated the vanity and flooring in here as well. We then created a completely new full bath in the basement, complete with a walk-in shower and single vanity. This Random Lake couple has been updating their older farmhouse in phases, and this project created a new master suite, including an all new master bath. Two smaller “farmhouse bedrooms” were combined into one larger room, and the existing tiny half bath was also incorporated into the space. This new room was then redesigned to create an amazing master suite, with a new walk-in closet and full master bath. The end result is a contemporary space which blends so well into the existing home it feels like it’s always been this way.